I was thinking about (Godly) relationships today, and that somewhat famous passage in Ephesians stuck out to me (as expected). Most of us are familiar with the "wives submit to your husbands", and in fact, I find that we tend to focus on it, both believers and non-believers, men and women. Many women claim that it's a sexist, male chauvinist command; many men use it as an excuse to make their women do their bidding. But I feel like when we only focus on that one part, we totally lose out on the whole picture. I've noticed that we tend to overlook a couple verses down where it says "husbands love your wives as Christ loved the church." Christ died for His Bride (the church), how many men are willing to die for theirs? How can a man ask his wife to submit to him if he is not ready to put aside what he wants, being obedient to God's command concerning their relationship? Christ's love for the church was enough that he suffered for us, even though he did not want to. In fact, he asked God to "take this cup of suffering away" from him. Yet, Jesus went through the process of being crucified for us. his clothing, his skin and his flesh was stripped away, and he was put to death for the sake of our relationship with him. Men, are you ready to for things to be painfully stripped away from you and things in you to be put to death for the sake of your marriage relationship? In the same way, women, what does your attitude about submitting to your husband say about your relationship with the Lord? Perhaps most important in this passage is the similarities in the two relationships mentioned. As the Bride of Christ, we are also required to submit to Him and to His authority. And as a husband, a man's love for his wife should embody the way Christ loved the church. We already know that our relationship with God is something that we need to constantly work on, develop and deepen, and this passage points out to us that marriage is the same way. 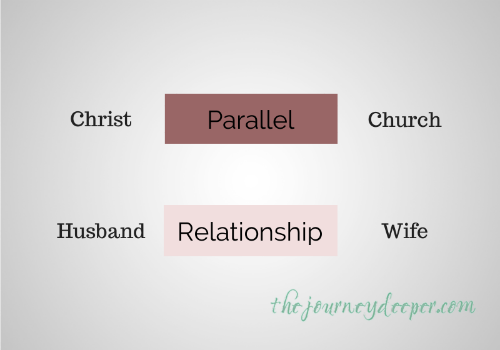 Maybe this understanding is what is missing in many marriages today. Amen, Sister!! Many times people think of this verse as telling women to do all that their men command. However, they forget that the men ought to command only as Christ would - Christ never gives a command for his own sake or selfish desires (which he has none), all of Jesus' commands are for the good of his bride. Exactly! Too often people twist this passage to suit their own desires.